Turn your Smart Phone into a Smart Blood Glucose Meter! The Dario Smart Blood Glucose Monitoring System integrates with your smartphone directly allowing you to monitor and track your blood glucose and other important elements, on your phone. This all-in-one system from LabStyle Innovations was launched internationally in 2013 and has been under review by the FDA since then. Dario was given the go ahead by the FDA in December 2015 and it hit the U.S market in mid May 2016.This system is a sleek plastic device that’s about the size of the normal cigarette lighter with a cartridge of 25 strips housed on top and a lancet built into the bottom. Dimensions: 104 x 21 x 11mm. There are two main things that make the Dario Blood Glucose Monitoring System stand out from other systems. The first reason is that it turns your smart phone into the glucose meter. The second is that the test strip and lancet holder are combined into one, convenient, easy to use and well-designed device. It is ideal for keeping things discrete because nobody would actually guess that it’s actually a glucose meter. The lancet that is housed on one end of the all-in-one device can be accessed by simply snapping off the orange piece. You can also set the needle’s depth, and then pull down the back piece in order to load the needle before pressing the button (orange button) to release it. Test strips are stored on the opposite end of the device. Therefore, there’s no need to carry around several pieces. Moreover, the cartridge that contains 25 test strips simply snaps into place and you just need to remove the white piece you’ll find at the end. The device comes with two test strip cartridges and each cartridge contains 25 test strips. The Dario Smart Blood Glucose Monitoring System turns your smartphone into a blood glucose testing meter by simply plugging in a very small attachment into the phone’s headphone jack. The meter attachment is also conveniently stored in the compact all-in-one device. The packing clearly explains how users can download the app and set it up on their phones. You can test your blood sugar by simply plugging in the attachment and opening the app. The device will prompt you to carefully insert a new testing strip before placing a drop of blood on the strip. The meter will count down by first filling in a circle before it displays the glucose level. The device uses a color coding system to show if the glucose level is within range, high or within the borderline. It will then take you to a new screen where you’re required to indicate whether it’s a bedtime, pre-meal or post-meal reading and then enter additional information related to physical activity, insulin, carbs and even tags. The Dario app is easy to use and very intuitive. It logs important data and then displays it in a clear and meaningful way to the end user. You can also set up your own personal profile which mainly includes the type of bolus/basal medication you use, your blood glucose thresholds and hyper/hypo warnings. Moreover, you can set reminders, track food, and sync fitness apps. The app is designed to automatically store all readings in the logbook. You can also choose if you want to view it as a chart, timeline, or list. The chart graphs up the last 14 days and you can share your logbook as a CSV or PDF file with your phone contacts or even by entering an email address. The app also lets you chart more including carbohydrate intake, calories and insulin doses and the results can be shared with anyone such as your doctor or family. Moreover, the statistics tab generally gives you a summary for a day, or the last week (7 days), month (30 days), or 90 days. This summary tells you the number of readings you had, the highest or lowest reading and then breaks the data down by how many readings were in range, average or below and then by how many hypers or hypos you had based on your custom settings. You can also click the summary box to see all the readings that fall into that specific category. This is an additional safety feature that once enabled on your device; Dario sends a text message to 4 people with your current blood glucose level and a link to where you are using your device’s GPS coordinates. This feature is ideal for people who have or had hypo problems in the past because they can go anywhere at any time with peace of mind. What are the Benefits of Dairo Smart Blood Glucose Monitoring System? The device is great when it comes to logging everything making your data super convenient to share. You don’t have to worry about charging your meter because the device will work as long as your phone does not run out of charge. The Dario Smart Meter is very small and compact. The case dimensions are 104mm x 21mm x 11mm. This includes the lancing device, test strips and the meter itself. The device does not sync with other diabetic devices. 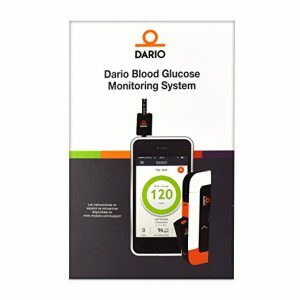 Is the The Dario Smart Blood Glucose Monitoring System for me? If you’re looking for a system that is compact and allows users to log readings directly to their phones, this device is a great option! For the Latest Bloodless Glucose Meter Options – Click here!